Despite the arrival of over $3 billion dollars in federal Community Development Block Grants for Disaster Recovery (CDBG-DR) from the U.S. Department of Housing and Urban Development (HUD) plus additional public and private aid, many low-income New Yorkers are still unable to fully access the resources and services they need to rebuild. * Only 110 of 19,920 registrants to Build It Back’s Single Family Rehab and Reconstruction program, or 0.55%, have selected an award and none have had construction begin. * Only 3 out of 1,051 registrants to the Multi-Family Building Rehab program, or0.29%, had begun repair work. * Only 178 out of a funded 600 Temporary Disaster Assistance Program (TDAP) vouchers for assistance to renters have been issued, roughly 30%. Of those issued, only 32% have resulted in tenants finding new apartments. This report outlines concrete ways in which Mayor de Blasio and city leaders can ensure that no New Yorker is left behind during Sandy rebuilding. 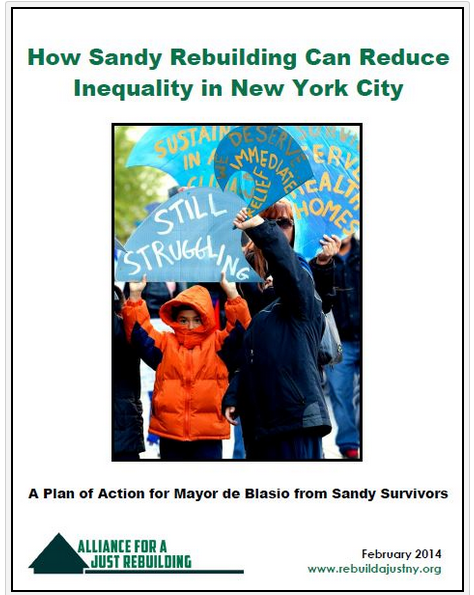 It offers guidance and recommendations for how Mayor de Blasio can make good on his promise of ensuring that the Sandy rebuilding process helps create a more just and equitable New York City. What follows is a four-point plan for ensuring that Sandy rebuilding actually helps tackle the inequality that existed long before the storm hit our shores. The plan focuses on four key areas of reform and action: 1) fixing and reopening the Build it Back program so that it serves more residents; 2) ensuring that rebuilding projects create family-sustaining jobs; 3) requiring long-term affordability for housing built in Sandy-affected communities; 4) investing in and bolstering the resiliency of public housing stock.